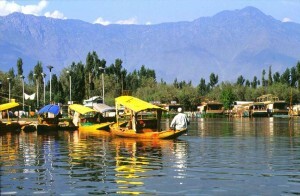 Srinagar is a unique city because of its lakes – the Dal, Nagin and Anchar. 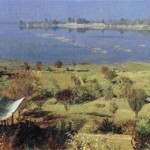 The River Jhelum also flows through a part of the city. 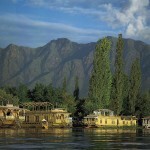 The Dal, Srinagar’s largest lake, as the most number of houseboats, followed by the Nagin and the Jhelum. Houseboats in the Dal are of all categories, from Deluxe through to D-class while those in the Nagin are largely Luxuary class and those in the Jhelum largely economy class. 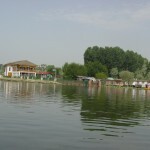 Most houseboats on Nagin and Jhelum are situated on the banks of the lakes. Most houseboats on the Dal are situated in long straggling rows some face the boulevard. A honeymoon couple may choose a houseboat with few, if any, close neighbors. To them it will be an advantage to stay in the interior of the lake. A family with children on the other hand may fine themselves better served in an area, which over looks the boulevard. Each houseboat has anything between 2 and 4 bedrooms in it with attached bathrooms and a common sitting and dinning room. A Sikara ride is one of the most soothing, relaxing aspects of a holiday in Kashmir. 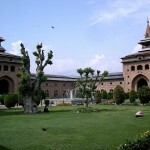 Nishat and Shalimar gardens as well as Hajratbal Mosque are directly accessible by Sikara. Air: Indian Airlines operate scheduled services from Jammu to Delhi and Srinagar/Leh. Jammu airport is 8 km from city centre. Jet Airways also operate services between Jammu-Delhi and Jammu-Srinagar. Rail: Jammu Tawi is an important railhead of the northern railways serving the Jammu and Kashmir State. Road: Jammu falls on National Highway no. 1-A and is connected by National Highway network to all parts of the country. 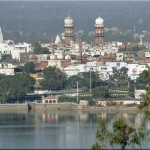 Daily bus services operate to and from Jammu to Delhi, Amritsar, Ambala, Chandigarh, etc. Deluxe and Video coaches are available on all routes. 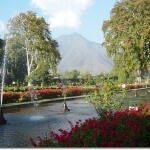 Mughal Garden: Kashmir was a favourite of the Mughal Emperors who visited it as often as they could. Cool and refreshing after the plains of north India where the business of governance kept them, they planted garden with stepped terraces and flowing watercourses. 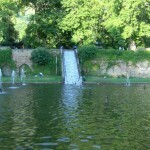 Cheshmashahi Garden: Cheshmashahi has only natural spring water enclosed in a closed pavilion. It is the smallest garden 108 by 38 mts. with a central channel flowing. The only garden where the visitor has to pay for admission. 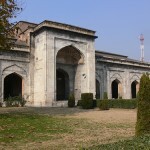 Nishat Bagh: Built by Empress Noor Jahan’s brother Asaf Khan. It is the largest of the garden, which is 548 by 338 mts. in area, garden with 10 terraces and 2 pavilions (one doubled stored). Hari Parvat: Topped by the ruins of a fort and northeast of Srinagar. It is an attractive picnic spot. 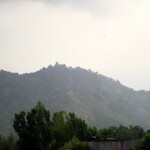 Shankarachrya Hill: Within Srinagar on its highest hill is the Shankarachrya Temple, nearly 1,000 ft. above the city. It is built in 2500 B.C. 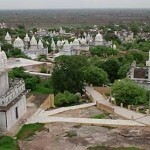 To the west of the city is the much lower hill of Hari Parvat, which is surrounded by a fort. Hazratbal: On the western shores of Dal and near Naim Bagh, scared Muslim Mosque preserved a single hair from the beard of Prophet Mohammad for about 300 years. A grand fair is held every year. Jama Masjid: It is a magnificent wooden mosque. Originally built by Sultan Sikhander. It is an example of Indo-Sarasenic architecture. 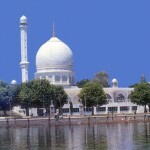 Pathar Masjid: It is built in 1623 by empress Noor-e-Jahan and situated on opposite bank of Jhelum River. 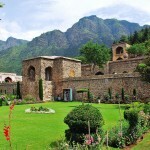 Pari Mahal: Ruins of this ancient college of Philosophy has now been turned into a Botanical Garden. Nagin Lake: Appears like a sapphire set in an emerald ring. The lake and its nearby Nagin Bagh are famous for beautiful singer birds. There is a club, a bar and a restaurant in Nagin Bagh. It is popular for swimming, diving and water-skiing. 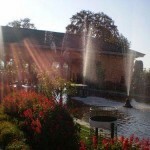 Nehru Park: Island Park with a swimming pool, a boat club, a garden and a restaurant. Achabal: At 1677 mts. a spot of wild beauties, amidst a garden a spring and three canals over three terraces. Tourist huts, tourist bungalow and a cafeteria are available. Ganderbal: At 5200 ft. and on the banks of River Sind provide excellent camping ground. 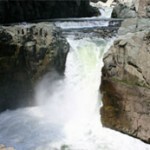 Aharbal Falls: Amidst picturesque environment the gigantic Aharbal falls makes a rainbow spectrum. Nearby Kungawatan is a breathtaking meadow. 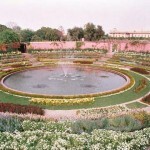 Shalimar Bagh: Jahangir, the Mughl Emperor, planted the shalimar. 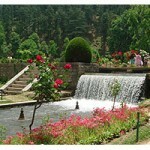 It is situated 16 km east of Srinagar, 539 by 182 mts. garden with 4 terraces, 1 canal and 1 terrace-attached pavilion of black stones. Special light and sound effect from May to October. 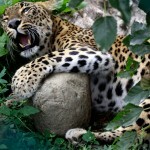 Dachigam Wildlife Sanctuary: This wildlife sanctuary is situated 21 km from Srinagar. Himalayan black bear, brown bear, musk deer, Kashmir stag and panther are found here. Mansabal Lake: It is a panoramic lotus laden lake, which situated 32 km from Srinagar. Bird’s watchers paradise, having camping grounds on its shores. 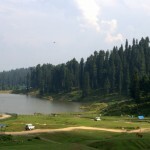 Yusmarg: Yusmarg is a small valley, situated at 40 km from Srinagar. It is believed that Jesus Christ had visited this valley in his days. Kausar Nag: At 3658 mts., the delightful lake with snowfields around it, lying 50 km south from Srinagar. Water Lake: Water Lake is situated 60 km from Srinagar and 19 by 10 km in area – the largest water lake in India with high mountains and a super spring. 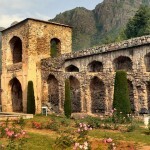 Martand: Martand is situated 64 km from Srinagar. Here the Sun Temple with massive construction stands for 1300 years. This entry was posted in Jammu & Kashmir, Srinagar and tagged about srinagar, Achabal, Aharbal, Aharbal Falls, Cheshmashahi Garden, Dachigam Wildlife Sanctuary, Dal Lake, Ganderbal, gulmarg srinagar, Hari Parvat, Hazratbal, Jama Masjid, jammu srinagar, Kausar Nag, Mansabal Lake, Martand, Mughal Garden, Nagin Lake, Nehru Park, Nishat Bagh, Pari Mahal, Pathar Masjid, Shalimar Bagh, Shankarachrya Hill, srinagar images, srinagar leh, srinagar pahalgam, srinagar photo, srinagar photos, srinagar pictures, srinagar tourism, Water Lake, Yusmarg. Bookmark the permalink.